Happy to have my second article in Northwest Travel Magazine! In this ravenous round of food-and-wine obsession, I explore haute cuisine, aka really innovative and surprising food, at The Painted Lady restaurant. Located in Willamette Valley and with a romantic guest cottage next door, The Painted Lady serves many of the most innovative dishes in all of Oregon, and it offers an Old-World style of dining that I love. 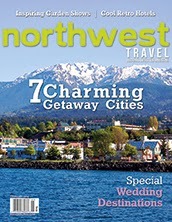 You can find my article in this month's Northwest Travel Magazine, and the magazine is sold in stores throughout the Pacific Northwest (all the way up to Alaska, indeed!). "Since 2005, husband and wife team Allen Routt and Jessica Bagley— both émigrés from Napa—have provided a romantic and sophisticated dining experience in a downtown Newberg restored Victorian home. They moved to the town of tree-lined streets and tasting rooms in the heart of Oregon’s Willamette Valley wine country to open The Painted Lady. With Routt in the kitchen, Bagley choreographs each night’s dinner service, and if it’s old-world opulence you’re looking for, you’ll find a level of refinement rare anywhere in the Pacific Northwest. In Portland, Oregon, The American Local restaurant opens January 15 (tomorrow), and I just returned from a surprising meal there. A venture by couple Jenny Nickolaus (host) and Chris Whaley (chef), The American Local will set up shop at 30th Avenue and SE Division, which Food & Wine Magazine named "one of the 10 Best Foodie Streets in America" in May 2013, and the concept is 100% American izakaya. Traditionally, an izakaya is a Japanese drinking establishment, and with the drinks come a fun menu of miniature dishes ideal for eating while drinking. The prominence of izakaya-style restaurants in Portland has been on a steady rise, and famously, Andy Ricker's Whiskey Soda Lounge is designed as a Thai version of an izakaya. If you want to know what it's all about, begin there. Kennebec Fries/Gravy/Cheese Curd/Foie Gras ($10): This dish will probably cause the most stir among diners. An even more decadent version of Poutine, the dish is finished by shaving foie gras on top. The fries are made in house, of course—lending a Portland ethos—but do we really need foie gras Poutine? If you're a fan of Poutine, which I am not, then the answer has to be yes: This dish has the meatiness of fresh cooked giblets, giving Poutine a kick in the... ah, giblets. Bacon Beignet/House Made Espellete Pepper/Honey ($5): Bacon flavored donuts par excellence! Why mess around with Voodoo Donut's Maple Bacon Bar when you can have it all integrated: the bacon, the sweetness, the dough? These tasty guys are just fun, and I thought they paired very well the "Spicy fermented turnip," i.e. turnip kimchi ($3). Crispy Grit Cake/Salmon Tartar/Sour Cream ($4): This dish is going to be The American Local's signature dish, in my opinion. It's light and beautiful. The grit cake has just enough of a hint of the flavor of Fritos to keep it interesting, and the tartar is obviously made using quality salmon, elevating the dish. I split mine: Don't make the same mistake. Brussels/Pickled Jalapeno/Blood Orange/Miso ($6): This dish was the first to show the chinks in The American Local's armor. Firstly, I loved the dish when all of the flavors were present; however, the miso and blood orange were mixed in inconsistently, and some bites lacked flavor. Since I ate it before the restaurant had even technically opened, I look forward to trying it again. Cumin Roasted Carrot/Avocado/Yogurt/Cilantro/Sunflower Seeds ($7): This complex dish places rustic carrots with harshly chopped tops and stringy bottoms still intact atop a silky yogurt. The cumin and avocado puts it over the top. This is one damn interesting vegetable dish, which certainly isn't common. Pork Belly Skewer/Sriracha/Maple ($3) and Butternut Squash Skewer/Pistachio Pesto ($3): If you like pork belly, this is a smoky, spicy version that shouldn't be missed. It melts in your mouth, and the grilled edges add a chewy texture. The Butternut Squash Skewer, on the other hand, was also smoky and the pistachio pesto added some flavor, but overall, I found it bland. Whaley's: Sadly, it's not to my preference. Additionally, the noodles were pretty tough, and the dish was difficult to share. The Takeaway: The American Local is an exciting restaurant in a neighborhood full of exciting restaurants. I think it will stand out though. As you might have noticed, the prices are low and the servings, especially in terms of the the vegetable dishes, are large. Having saké as well as two wines on tap lends a fun atmosphere—as does the simple and astute decision to offer an American-style izakaya. Portland and pub food have had a long and beautiful relationship: Maybe it's time to embrace the next level.